Applications are now open for the 2017 IOI-SA Course in Ocean Governance. 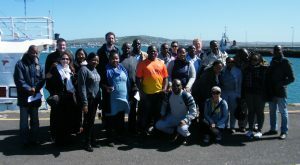 The IOI-SA will be running the annual course in Ocean Governance for Africa in collaboration with the South African International Maritime Institute (SAIMI), the South African National Biodiversity Institute (SANBI), and other partners, from the 4th to the 29th of September 2017. The course will be based in Cape Town (hosted at SANBI, Kirstenbosch). The deadline for applications is 13 April 2017. The 4 week course focuses on an array of pressing ocean governance issues. The interdisciplinary approach is designed to include lectures and field trips that demonstrate practical examples of governance tools, mechanisms and engagements with real-world applications in Africa. Further information about the course and the application form can be found here.